Summary: Why do teachers so often attribute their personal and professional “transformation” to their writing project experiences? Researcher Anne Whitney considers how participants’ writing time and writing group experience impacts their identity as writers, learners, and instructional leaders. Reading this study could spur an interesting discussion about what writing experiences are transformational and essential when planning learning for new teacher participants. Teachers have voiced claims that their lives were changed or that they were transformed by the NWP. These claims have tended either to add to the mystique and attraction of the NWP for potential participants or to detract from its reputation as a site for serious learning and cast upon it a sort of cultlike aura, depending on the perspective of those hearing the claims. And these claims have sometimes made it difficult for researchers to see clearly what teachers do learn in the NWP or how that learning affects those who participate, since available data on NWP experiences has tended to take on a testimonial, almost conversion-narrative feel. In other words, if you ask teachers what happened to them at the NWP Summer Institute, more often than not you get a standard narrative of change, so uniform across participants that it seems almost canned—and these narratives, while celebrated among NWP insiders, have the unfortunate effect for researchers of obscuring more than they reveal about the particulars of the Summer Institute experience. Whitney, Anne. 2008. 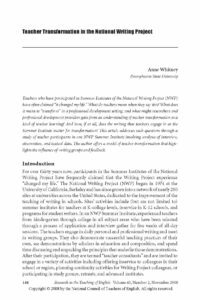 “Teacher Transformation in the National Writing Project.” Research in the Teaching of English 43 (2): 144—87.